Dissolves Bright and Produces a Good Lasting Head on Ale and Porter. Sample by Post 1 1/2 d., to Cream 36 Gallons to the Last Glass. Gives Neither Taste nor Smell. Earlier in the century, the law was clearly against addition of such foaming agents and books and articles appeared, familiar to those who plumb brewing history, fulminating against additives in beer. Getting a good head on beer, especially porter, was a desideratum of all brewers then. “Beer druggists” ranged the country supplying brewers who needed a little help. Various nostrums were used for this. They included copperas or green sulphate, and various concoctions which included cream of tartar, an acid derived from wine lees which may lie at the root of the names cream ale, cream porter and cream soda as I argued the other day. In 1880, the “free mash tun” became law in England. This meant a much larger range of fermentables could be used in mashing than before, things such as corn (maize) and oats. Whether by 1886 the law on adding non-fermentables such as a foaming powder had also changed, I cannot say. One of the expressed purposes of The Brewers’ Guardian was to deal with legal developments. Given this, I doubt something advertised in its pages would have been unlawful. Even if the use of foaming ads was prohibited for commercial brewers, the ads may have been directed ostensibly to so-called private brewers. They didn’t pay excise tax and weren’t regulated in the same way as the others. Be that as it may, it shows that some English brewers were using a powder to increase their beer’s foaming. If they were, it is highly likely America’s ale brewers were doing it for their ale and porter. North America’s top-fermentation tradition comes from Britain. Many brewers who founded ale breweries in North America in Victoria’s time came from Britain or were of Anglo-Saxon origin. These include the founder of Ballantine beer in Albany, NY, Sleeman in Guelph, ON, Greenway in Syracuse, NY, and Lill in Chicago. The last three all made cream ales, and possibly Ballantine did too, I would need to check. In the full heyday of 1800s Anglo-American brewing, there was much more to unite brewers from the two components than separate them. A separation did finally occur but only after 1900. (In a nutshell, ale here became more lager-like while Britain hewed more closely to its ancestral traditions including in the matter of cask-conditioning). If anything, the practice of using a foaming aid may have been more prevalent in North America as I believe there were no laws against it in the 1800s. Cream ale starts to emerge in ads in the 1830s. Bradley’s nostrum surely was a combination of cream of tartar and a carbonate of some kind. It was a dry powder, as baking powder is, and also, in 1888 Bradley applied to modify the patent by excluding any claim for dextrin. In the application, he referred to the original specifications, and the ingredients included saponin, calcium and magnesium carbonate, and “other salts”. Cream of tartar is a salt in chemistry, of potassium. If a carbonate was there, almost certainly an acid was, too. Saponin is an extract from the plant world, soap-wort is an example (wort, we can’t avoid the brewing context, eh?…). Saponin is used to manufacture soap and detergents. It makes perfect sense that a mix of saponin and baking powder would make a good head on a beer. “… for producing a permanent head of creamy richness on all ginger beer, ginger ale, lemonade and other aerated beverages; also on beers, wines, ciders, etc.”. There you have the link-up with soft drinks; both top-fermenting brewers and soft drink makers used, we can infer, a form of baking powder to ensure good foaming of their beer. It wasn’t just a few lager brewers in the New York area, per the City of Brooklyn investigation and New York State Assembly documents (1880s) I referred to earlier, who were combining an acid and a carbonate to raise a head on their beer. Nor can it be argued that Every Man His Own Brewer’s advice in 1768 to use (ironically) non-adulterated cream of tartar to make beer brisk was vague or a one-off, as well into the 1880s brewers were buying powders to make beer “creamy” which would have incorporated the very thing. There is no question that Bradley and Bush were using dairy cream as a metaphor. But this is the 1880s. By then, what I apprehend is the second of the double-associations of the terms cream ale, cream porter, cream soda became the one that resonated with the public, even the average brewer. This doesn’t mean in other words the origins of the name don’t lie in chemistry via the term cream of tartar. I could be wrong of course but what seems normal to us now, that “creamy” naturally applies to a nice head on a beer, isn’t necessarily how people viewed it when cream of tartar first went into a vat of beer. The association with a viscous thick substance like dairy cream only may have come later, once it was seen as a nice coincidence that cream in its dairy sense applied metaphorically to very fizzy beer and soft drinks. Indeed the dairy cream analogy was preferable to a sense lying in obscure chemistry, especially as no one wanted to emphasize the chemical meaning due to the always-present public concern adulteration. By the early 1900s, modern microbiology and biochemistry had commenced. While additives in beer were far from being discarded (au contraire), all that was left in brewers’ and brewing scientists’ minds regarding cream ale was fizziness and the head. This is evident from how Wahl & Henius in their pre-WW I text treat it as I said earlier, and also the way A.L. Nugey discusses cream ale in his 1930s Brewing Formulas Practically Considered, a text I’ve also discussed earlier. Nugey stated simply that cream ale was “lively” beer and “krausened”. The krausen process is where newly-fermenting beer is added to matured lager to spark a new fermentation to make it foamy and carbonated. Clearly, cream ale’s lively character probably since before WW I has been created through krausening, injected CO2, or some other usual method which eschews additives. (In other words, while foaming agents certainly are used today by some brewers, I’d doubt they are used any differently for cream ales). The term krausen and its derivatives are of German origin. While it is tempting to think they suggest a German brewing origin for cream ale, I don’t think that is the case. There are too many associations with English and Anglo-American brewers to suggest that cream ale doesn’t come from an Anglo-Saxon tradition, IMO. 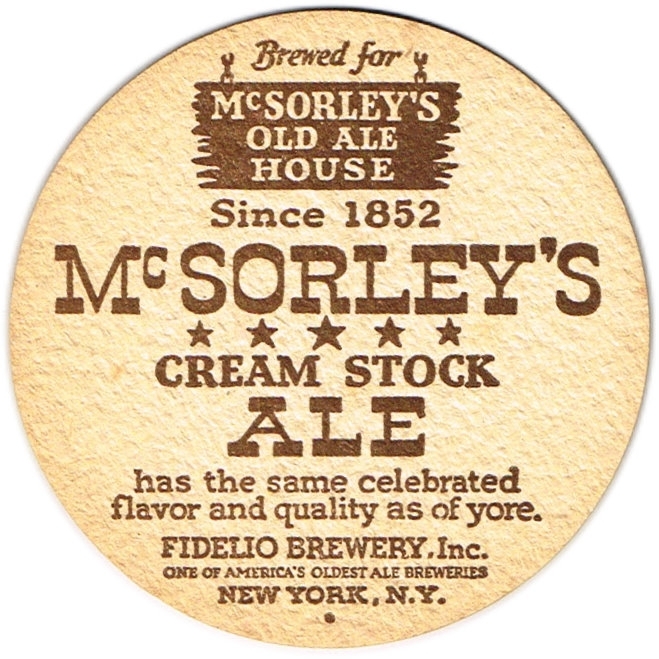 Also, cream ales and cream beers of various styles proliferated in the 1800s and 1900s. See this eBay listing of labels which covers a wide range of breweries and styles for the 1900s. Earlier, I had thought cream ale probably originated in New York State and spread to a couple of adjoining states and Ontario in Canada. In fact, there were breweries in a much wider part of the States and Canada which had cream ales, cream porters or stouts, and cream pilseners. At least two reputed breweries in Chicago made cream ales before the Civil War. An old bottle cap for Labatt 50 Ale states, “Labatt 50 Cream Ale”. This tv ad from the 1990s in Quebec’s French market advertised Labatt 50 Cream Ale and the announcer said, “Tout l’arôme d’une ale anglaise“. While this choice of terminology for Labatt 50 came relatively late (the brand only dates too from 1950), it suggests to me a well-carbonated beer of English origin ultimately. “50” was and still is top-fermented, for example. In the end, I think the tradition behind the cream-denoted beers was neither parochially German nor geographic in the sense mentioned, nor simply the result of a pleasing metaphor involving dairy cream, but rather was characteristic of a wide area where early brewers of English tradition were familiar with powders which ensured a good head on a beer, of which cream of tartar was an essential component. To me this argues English roots reaching back perhaps to 1768 and Every Man His Own Brewer and to cream of tartar. Still, one can’t exclude the dairy cream metaphor or a German brewing technique, maybe krausening, as explanations, it’s possible. Note Re Image: The image above was sourced at the Tavern Trove webpage, here, and is believed available for historical and educational purposes. All trademarks or other intellectual property shown belong to their owner or duly authorized users. All feedback welcomed.